Better Focus And Build New Habits Guaranteed To Skyrocket Your Productivity... Without Wasting Time Or Procrastinating!" Suppose you could just read a book and develop better focus and concentration. Imagine... You'll no longer struggle to complete your tasks and suffer from incomplete 'to do' lists. Instead, you'll just blitz through them all to effortlessly meet your targets and achieve your goals. Well, it isn't if you have the right productivity habits and focus on building success systems. Think about it. A success habit is the most powerful skill you could ever learn. It puts all your goal-oriented efforts on auto-pilot, acting like your internal GPS to guide you relentlessly towards your dreams. A success habit makes your efforts more likely to be productive and fruitful - without you ever having to think about it! Simply put, success habits guarantee your growth, progress and accomplishments. It could take you years and can cost you a small fortune to figure out just the right combinations that make some habits stick - while others fall flat on their face. "Knife At A Gun Fight"
At last! Every tip, trick and secret to building success habits is here. Download the book - Go here now! Could You Use To Save Time & Be More Efficient? In "Knife At A Gun Fight", you'll learn all about this... and more! ways to lower stress, avoid rushing, and feel fulfilled - you won't hate your job any more! 4 ways to look at goals you've achieved - and leverage them for maximum benefit. Well, realize that this personal productivity guide could easily sell for hundreds of dollars. In fact if you asked a top self help guru or productivity coach for a customized program that's tailored for you, you'd be charged in the neighborhood of $1,997.00 to $4,997.00 - not including your time and travel to attend their coaching sessions. So at bare bones minimum you're getting thousands of dollars worth of tested and proven advice and guidance at your disposal. Order Your Copy Right Now - Click Here! So what's the catch? Why am I practically giving away this resource? Well, it's really quite simple. I have little if any cost in printing and distributing this ebook - and most people who desperately need the information can't afford my private coaching, which begins at $500 a month and higher. Free Bonus Gift #1: The 33:33 System - an exclusive short special report that outlines a simple trick that boosted my productivity by a stunning 38%, and will work for you, too. Free Bonus Gift #2: No Time? Read This! - a short, simple exploratory journey into the heart of time management, designed to give you a fresh new view of how to get more efficient, easily. Free Bonus Gift #3: 10 Success Secrets - a confidential report I created for my high-end consulting clients, sharing 10 simple rules to help you get ahead in business - and in life. 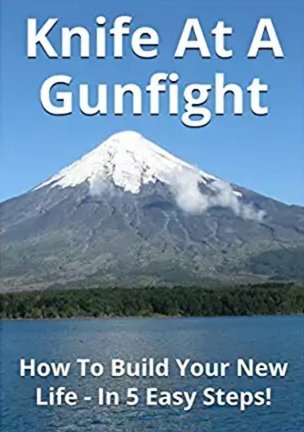 Together these three free bonuses are worth more than triple your investment in the 'Knife At A Gun Fight' -- but they're all yours absolutely free when you order by midnight today. I personally guarantee that if you go through this personal productivity guide, use at least a few of the tips, techniques and strategies to improve focus, beat procrastination, set goals, build new habits and blitz through your to-do list, you will transform your life and skyrocket your productivity. You'll get more things done, reduce stress and anxiety in your life, set and achieve meaningful goals, and be on course to reach your important milestones and targets - all the while, acquiring and retaining good success habits that will keep you on track for years to come. If after a full 60 days, you honestly believe I haven't delivered on this promise then let me know and I'll issue you a prompt and courteous refund. Plus, the free bonus gifts are yours to keep regardless, just for your trouble. That means you can try out all the techniques, tactics and strategies at my risk, while you see if they work for you or not. And if they don't produce the results you hoped to see, I honestly want you to ask for your money back. And I'll let you keep the free bonus gifts as my way of thanking you for giving "Knife At A Gun Fight" a try. There is absolutely no risk, whatsoever on your part. The burden to deliver is entirely on me. If you don't boost your productivity immediately using these methods then I'm the loser, not you. These Success Habit Building Secrets! It's easy to get started right away. Just click here to order "Knife At A Gun Fight" today. Get ready to beat procrastination, improve your focus, boost productivity, get things done - and achieve all your goals, starting right now! P.S. Just think! You'll never again suffer through the pain and hassle of wasting time, losing focus or missing targets. You only have one life. Make it count. Read this powerful book today... Go Here Now! Need any help? Open a ticket at our help desk.